Blog dedicado a toda a iconografia e memorabília dos diversos Nacionalismos Europeus. 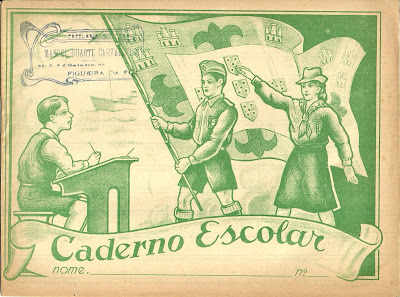 (1926-1945)Dirige-se essencialmente a coleccionadores e curiosos desta temática bastante rica em uniformes, distintivos, e condecorações. Abrange também o período da 1ª Guerra Mundial (1914-1918) AVISO: Este não é um blogue de carácter politico.Pretende apenas mostrar alguns aspectos da recente História passada, sem complexos e tabus.Trata-se apenas de um espaço de carácter histórico. Alguns coleccionadores tem sentido algumas dificuldades em identificar as placas de Identificação Alemãs, no que respeita à 2GM...Em Inglês, este tipo de placas, e na gíria, são denominadas "DOG TAGS"...em alemão são conhecidas como as "ERKENNUNGSMARKEN". Genéricamente estas placas de Identificação, eram transportadas ao pescoço do soldado, e em caso de morte do mesmo, a placa, servindo de identificação, era dividida ao meio, em que uma parte era sepultada com o soldado, e a outra metade, era dada ao comandante de companhia ou batalhão que a faria seguir para os serviços do Exército Alemão encarregues deste tipo de serviços.Tudo era devidamente organizado, e tudo registado. Obviamente que, no "calor das batalhas" muitas se perderiam, e não era raro que os soldados não fossem sepultados sem placa de identificação, ficando anónimos para sempre. Erkennungsmarken (identification tags, and often abbreviated "EK") were issued to all existing members of the Wehrmacht on the first day of mobilization in 1939. 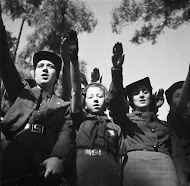 Wartime recruits, of course, did not enter the Wehrmacht directly through a field unit. New recruits were first enrolled in an Ersatz (replacement) unit and issued their tags within a few days of their induction. 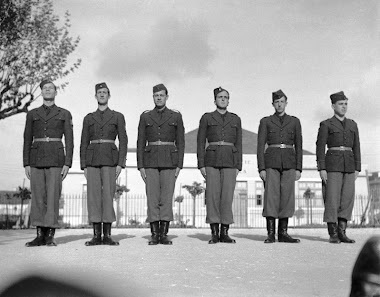 Based on the Soldbuchs of two FK272 men who were inducted in June of 1944, we can formulate a likely scenario for the issuance of their tags: a day or two within the actual time of induction of these men (Horst Swensen & Harald Nehring), they were standing in a line through which they were issued both their dogtags and their Soldbuchs. The dogtags were pre stamped with the logo "INF.NACHR.ERS.KP.208" and a serial number, but no blood type. For wartime recruits, as we can see, the initial dogtag would be stamped with the name of some type of Ersatz unit. Since large numbers of recruits would be issued dogtags from these units, the serial numbers can be quite high; serial numbers for these tags over the 2000 mark are not uncommon. Like anything else, a dogtag can be lost, misplaced, or otherwise disposed of (one member of FK272 was brought up on charges for attempting to sell his dogtag at a local bazaar!). When this happened, the unit which the soldier belonged to was responsible for issuing him a new one from their own stores. 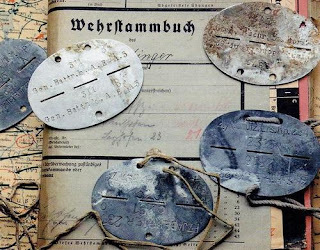 According to Wehrmacht regulations, every field unit was required to keep an inventory of pre-named and numbered tags equal to 20% of the unit's authorized full strength. These field-unit-issued "replacement" tags have several points in common: for one, the unit name on the tag will be that of a wartime field unit, and two, the serial number should be relatively low. PLACA DE IDENTIFICAÇÃO DE PILOTO DE "STUKA"
Tags were made of several materials, depending on what period of the war they were issued and who issued them. The earliest tags were made of aluminum, and this material appears to have been common until perhaps 1941 or 1942, when zinc began to become more common. Zinc remained the material of choice until war's end, even though steel superseded it in some high-volume replacement units during the late summer and fall of 1944. As you would expect, the use of various materials saw considerable overlapping, with some aluminum tags being issued as late as 1943, especially amongst specialist replacement units or field outfits which would not issue enough tags to have to replace their stocks with tags of a newer material. The actual shape of the tags also varied, with the oval shape ranging from almost round to almost pointed. One late-war field-unit tag from Gebirgs Artillerie Regt. 1057 has a series of holes in lieu of the typical three long slots to aid in breaking the tag in half. There are two variations in the orientation of the stampings, depending on who issued the tag. For some reason, Ersatz units and many "zone of the interior" units usually stamped their tags so that the bottom of the inscription of each half faced the axial perforations. In other words, no matter which way you look at one of these tags, one of the inscriptions will be right-side-up and the other will be upside-down. Field units generally stamped their tags so that both inscriptions are right-side-up when the tag is held with the two neck-cord suspension holes are at the top. These orientations are not rules, however, they are tendencies; there are sure to be exceptions! The actual type of stamping also varied. A few tags are stamped completely in capital letters, but most are stamped in a combination of capitals & lower case letters. The earlier tags also tended to use larger-sized letters. Some tags used scribed-in guide lines to help stamp the letters in a straight line, and some do not. One tag examined still bears pencil marks as guide lines. According to Wehrmacht regulations, the actualstamping was carried out in a unit's Waffenmeisterei (ordnance section). In fact, the first tag issued by Füs.Kp.V.Gren.Div.272 (Serial #1), was worn by Heinrich Dietz, the Waffenmeister himself! Blank tags were requisitioned via battalion from the Bekleidungsanforderungs-Dienstwege (clothing requests channels). The regs also stated that the unit name be stamped above the serial number, but the shape of the tag leaves more room at the center of the tag for the long unit names; it seems that it was more common to stamp the number above the unit name, especially in the "mirrored" inscriptions of the Ersatz unit tags. The addition of a blood-type stamp appears to have been a mid-war development, and may have been done by the field units themselves. Army dogtag regulations of September, 1942, make no mention of blood-type stamps, so they are presumably of a later date. In addition, close examination of a number of dogtags from FK272 show markings made by the same stamp, even though the tags originated from different Ersatz units! This would indicate that the blood-type letters on these tags were stamped by FK272 when the soldiers arrived. Late-war tags without blood-type letters on them may have belonged to soldiers who were not yet assigned to a front-line unit or they may have been souvenired from stocks of unissued tags. If a man was discharged, the regulations specified that his tag was to be turned in and the inscription struck out so that it could not be reused. The defaced tag was then turned in for scrap. The regulations also stated that alterations were never to be made to any tag. The tag illustrated as example 2, below, shows that this regulation was no more sacred than any other. Altered tags are rare, however. Since German tags lack the name of the wearer, it was vital that the Wehrmacht keep careful records which would connect the tag to the soldier's identity. Every unit (of company size) kept a special list of every member of the unit and his dogtag inscription. This list was known as the Erkennungsmarkenverzeichnis, and a copy was sent 10 months after the unit's formation or mobilization to Der Wehrmachtauskunftstelle für Kriegerverluste und Kriegsgefangene (Armed Forces Information Office for Casualties and POWs) in Berlin. Every month thereafter, the unit was obliged to send in an update called a Veränderungsmeldung (change report), of the same format, which listed only new tags, replaced tags, or tags lost due to transfers or casualties. There have been recent incidents where fallen soldiers could not be identified and severely wounded or sick patients could not be processed in hospitals because the soldiers were carrying neither identity disc nor Soldbuch. We have only to notice the vast numbers of inquiries or photograph searches for the effects of this. The stress this transgression creates for next of kin (not knowing the fate of a loved one for months, delays in securing last effects, difficulty in making out death certificates and supply requisitions etc..) has already been communicated. It also causes an increase in written correspondence. 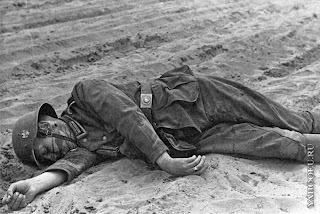 The soldier must wear his tag on a string around his neck; carrying it in his pack, his wallet, or a pants pocket is forbidden, Likewise is the Soldbuch always to be carried in the tunic pocket, never left in a pack. Inspections should be made as often as possible at roll-call, quarters inspections, and when falling out for duty. Every unit (including medical facilities) has the soldier has both his dogtag and his Soldbuch. The Deutsche Dienststelle (WASt) is a German Agency (WASt) based in Berlin which maintains records of members of the former German Wehrmacht who were killed in action. 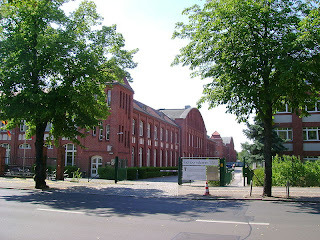 Formerly called the Wehrmachtsauskunftstelle this agency also provides information about the fate of foreign and German soldiers as well as prisoners of war in Germany. This kind of information is used for civil proceedings as well as an official register of war graves. Kassel, March 2012 - The Volksbund Deutsche Kriegsgräberfürsorge e. V. is a humanitarian organization which is charged by the Federal Republic of taking care of registering the German war dead abroad and to ensuring that it is updated and monitored. The German Public Alliance advises relatives of war grave care, supervises public and private sites, supports international cooperation and assists within the sector of war grave care and fostering the engagement of young people in the last resting-place of the war-dead. Today the Volksbund includes more than 400,000 active members and donators as well as more than one million interested people and persons who occasionally contribute to our organization. With their contributions and legacies and income from inheritances and bequests as well as the income from house and street collections, which take place every year, the Volksbund finance their own activities to almost 75 percent. The rest is made up from the public contributions of the federation authorities of the countries. The non-commercial Volksbund organization was founded December 16, 1919 out of necessity. The young republican government was neither politically nor economically in a position to take care of the graves of the soldier’s killed in action. This was mainly assigned to the Volksbund which was understood as a citizens’ action committee. 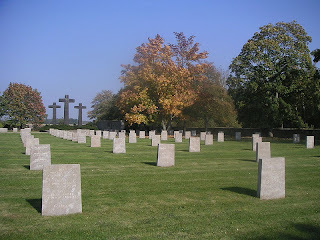 From then until the beginning of the thirties, the Volksbund expanded the number of war graves. 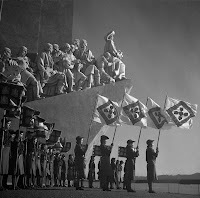 From 1933 on, the leadership of the Volksbund submitted themselves of their own accord to the political alignment of the National Socialist regime. The construction of the military cemetery of the Second World War was undertaken by the grave care service of the armed forces. 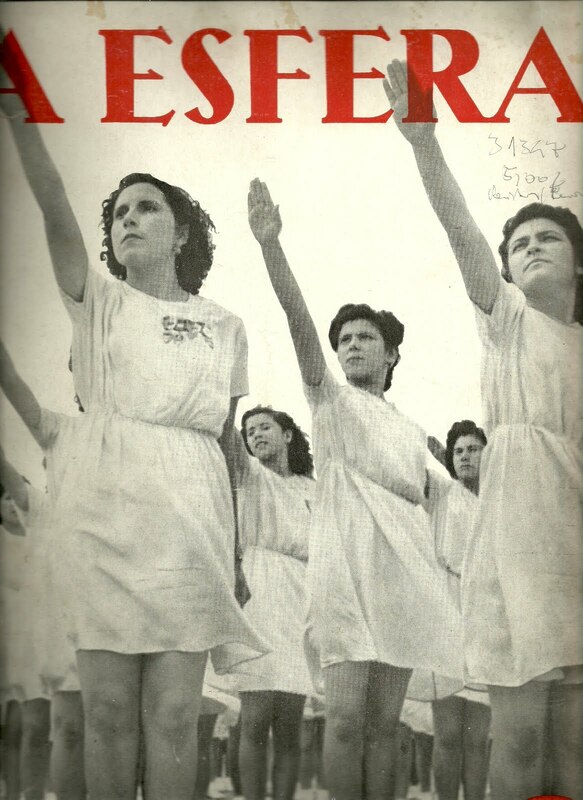 It was not until 1946 that the Volksbund could take up their humanitarian activity. In a short time they managed to construct more than 400 war gravesites in Germany. In 1954 the Federal Republic commissioned the Volksbund to identify, protect and maintain German soldier’s graves overseas. Acting within the scope of bilateral agreements, the Volksbund started their work within Europe and Northern Africa, being responsible for 825 war gravesites in 45 countries with about 2.5 million war dead soldiers. More than 9,000 volunteers and 560 salaried employees fulfil the various activities of the organisation today. After the political revolution within Eastern Europe the countries of the former Eastern Bloc were included in the work of the Volksbund. 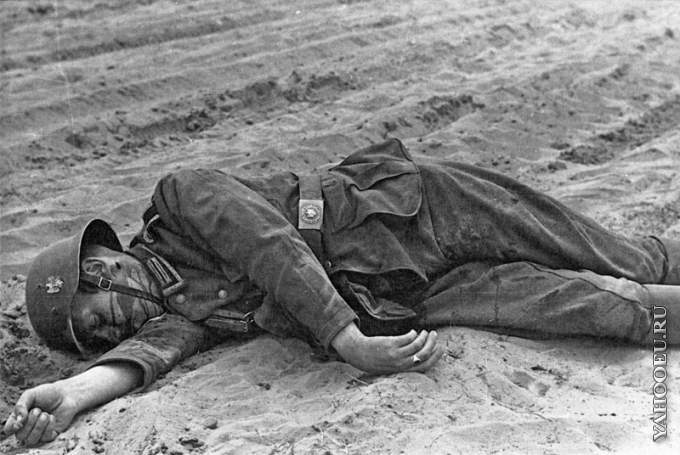 Approximately three million German soldier’s had lost their lives in the eastern countries in World War II. i.e. more then twice as many as the rest of the war gravesites in the West which brought the Volksbund immense challenges not least that more than 100,000 graves were difficult to find, had been destroyed, had been overbuilt or had been plundered. 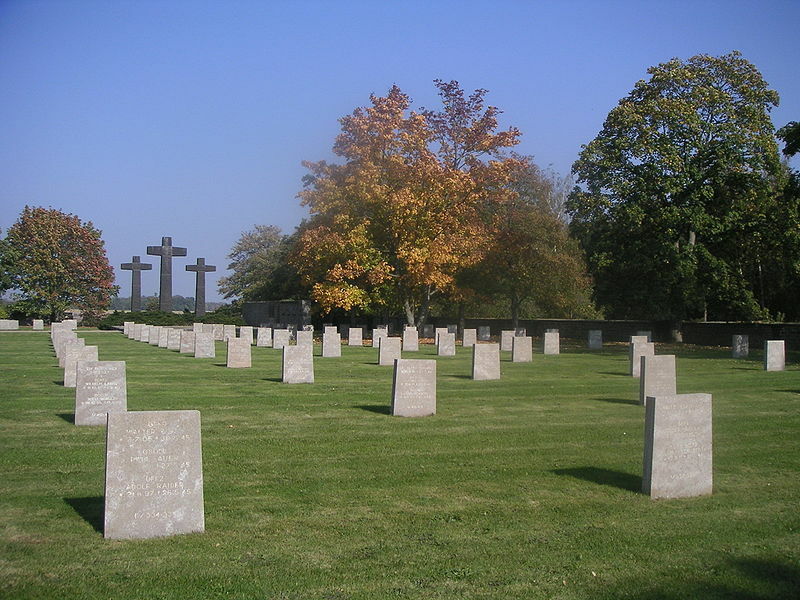 Regardless the Volksbund took care, repaired and constructed more than 300 cemeteries of World War II and the 190 grounds out of World War I in Eastern, Central and South Europe. There are 55 central cumulative cemeteries. Approximately 716,000 war dead have been reinterred. The Volksbund founded the phrase “Gedenken und Frieden” - “Remembrance and Peace” to explain its purpose and guarantee long-term safeguarding. The Volksbund enshrines the remembrance of the war dead by constructing and conserving the cemeteries. The huge burial grounds remind the people of the past and confront them with the consequences of war and violence. To these purposes the Volksbund arranges trips to war graves and organizes national and international youth camps at war graves and memorials to care for and maintain military cemeteries and it works in schools and other youth organisations to inform them of its work and engage with young people. The motto for these activities: “Reconciliation above the graves”. Further the alliance founded meeting places and places for education for teenagers close to four cemeteries, where school classes/groups and youth groups are able to become involved with projects designed to promote peace, reconciliation and understanding. The Bundeswehr and Reservists Association are supporting the Volksbund by working on national and international war graves, by organizing workcamps, at commemorative events as well as in the carrying out of house-to-house and street collections. The Volkstrauertag (day of national mourning in Germany), which is in November each year is arranged by the Volksbund nationwide and solemnized by important political and social bodies as well as the German population. That day is a day of remembrance and a demand for peace. A.H…………………………………………………..- Leibstandarte SS "Adolf Hitler"
Ers.Abt./R.G.G............................................. .....-Ersatz-Abteilung Regiment „General Göring"
Gr.Str............................................ .......-Gruppe Strafgefangenen beim General z.b.V. 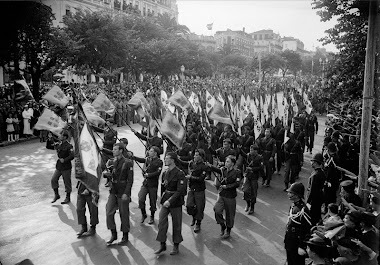 Luso-Italiano, apaixonado pela História Militar especialmente no que toca ao capitulo da Guerra Civil Espanhola, e 2ª Guerra Mundial. O BOMBARDEAMENTO DE GERNIKA-MITO OU REALIDADE? 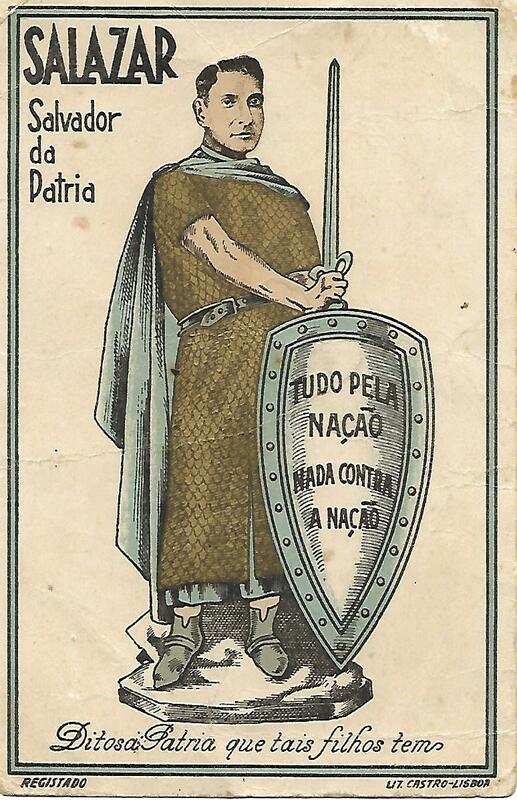 1938-CRUZADOR ITALIANO "DUCA DEGLI ABRUZZI"
VIRIATOS MILITARIA. Tema Janela desenhada. Com tecnologia do Blogger.